Nalboor Tiles Limestone Limestone vs. Travertine: Which One to Choose? Travertine and limestone are often confused, but there are important differences between these stones. It’s important to understand how each one stands up to regular use, foot traffic, and even water so that you can make the right choice for your home. Before placing an order for either one, here’s what you should know about these stones. Travertine is actually a type of limestone that is primarily made up of calcite, and this makes it a softer type of material than traditional limestone. While limestone is formed when the stones are subjected to intense heat and pressure, travertine forms when mineral deposits build up on the bottom of lakes and riverbeds. This makes a drastic difference in how each stone performs. Limestone is formed through pressure, and that means that it’s solid all the way through. Pitting and dimpling in limestone is rare, so it’s a great choice for high traffic areas. On the other hand, travertine is often riddled with porous marks that ultimately weaken the stone and make it less durable. While it still looks beautiful and can be a good choice in some applications, it’s not as well suited to high traffic areas and steady use. Manufacturers are able to strengthen travertine by using resin fillers in the stone. This fills the little pockets and creates a very stable surface. The problem is that the resins can separate and weaken the tile. This is why underfloor heating is never recommended with travertine tiles. If you want to have warm floors in any kind of weather, then you’ll need to go with a limestone or marble tile that was formed under heat and won’t be impacted by it. Limestone is naturally a light and bright color, and you’ll love how it can brighten up a room. Shell Reef natural limestone starts out as a bright white that will soften slightly with age and use. Champagne White limestone is also a brilliant shade, but it has a smoother finish and is a more durable stone. By contrast, Saturnia Ivory Travertine light has a darker ivory shade that will look great in casual and formal rooms alike. There are minimal fills with this stone because Nalboor Tiles carefully chooses only the top 10% off produced tiles for sale. If you really love the look of travertine, then you’ll be relieved to know that you can take steps to preserve the stone and help your new floor last longer. Travertine tiles are filled and polished for greater durability, but you can also take some steps at home to help avoid problems in the future. The first thing is to seal your new floors to prevent liquids from seeping into the pores. We offer different sealers, including options that will make your kitchen floor anti-slip or bring out the colors in your travertine foyer. As with limestone, travertine should be dust mopped regularly and cleaned at least once a week. Floor mats are strongly encouraged to keep dust and dirt away from the tile floor. If you do notice a stain, a poultice may be used to help rub out it. Travertine is still a great choice for the bathroom, kitchen, and dining area, and it can add a good deal of depth and visual appeal to your living space. Travertine is typically quarried in Italy, and limestone is commonly found in New Zealand. 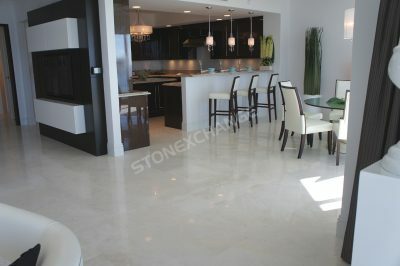 However, both stones are carried by Nalboor Tiles and are available at our South Florida showroom. We can provide you with domestic shipping to any location in the contiguous United States and the Caribbean. Both stones have a slightly softer feel that you may prefer. Just as you can feel the difference between fired ceramic tiles and vinyl, you’ll feel the difference between marble and limestone or travertine. Some people believe that these light colored stones simply feel better under their feet. The texture also won’t be quite as slick as a completely smooth marble or granite, and that’s a desirable feature when you’re dealing with areas that routinely get wet. Here at Nalboor Tiles, we’re able to provide you with wholesale pricing on top-quality stones. We oversee everything from the manufacturing to the final delivery, and that allows us to provide you with beautiful stones that you’re sure to love. By focusing our specialty and maintaining our passion for luxurious stone tiles, we can deliver the great looks you’ve been dreaming of. Customer satisfaction is our main priority, so we offer wholesale pricing to the general public. As you increase your order size of any one stone, your price-per-square-foot will drop. Give us a call at 305-501-4548, or visit us online to check out our selection of travertine and limestone.